Question: I recently noticed an unpleasant odor in my car, which turned out to be caused by my waders in the back. Can you wash breathable waders without ruining them? If so, how? Not only can you wash breathable waders, but you should if you want them to work as well as possible. Answer: Not only can you wash breathable waders, but you should if you want them to work as well as possible. Dirt, grime, body oils, and abrasions can lessen the effectiveness of the durable water repellent (DWR) coating used in breathable-wader materials. According to Orvis wader developer Tim Daughton, periodic cleaning helps the wader material to breathe better and restores the DWR coating that causes water to bead up and run off the outside of the wader. Warning #1: Always read the manufacturer’s instructions for your particular waders, as there are some variations among the different technologies now in use. That said, most manufacturers call for hand-washing your waders with a powder detergent that contains no fabric softeners or bleach. There are several specialty cleaners, such as Revivex Synthetic Fabric Cleaner and Nikwax Tech Wash, available that are designed specifically for use with waterproof materials and DWR coatings. 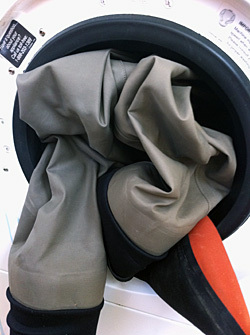 After washing and rinsing the waders thoroughly, air them dry, both inside and out. Of the manufacturers I checked, only Orvis suggests putting the waders in the washing machine on “gentle,” and this is for stockingfoot versions only. Once the waders are clean, you can go a step further and reapply a DWR treatment such as Nikwax TX-Direct or Revivex Spray-On Water Repellent. Because these products set best under heat, you can use an iron (on low setting) or a hair dryer. There’s an excellent explanation of how DWR works—and why cleaning and reapplying are effective—on the REI website. If you poke around on the websites of wader manufacturers, you can usually find all the information you need. But… Warning #2: Make sure you read the care instructions that came with the waders. Some of the best manufacturer “Care & Washing” pages can be found on the Orvis and Patagonia websites.